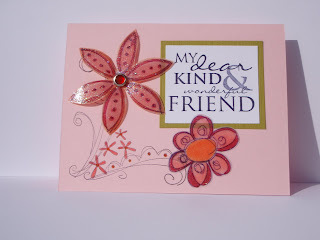 With this card, I stamped on cardstock vellum with my image and stazon, then I coloured the image with SU markers. I let it dry for a minute, then I turned it over and embossed the other side of the image with Iridescent Ice. They I cut out the flowers and adhered them to my card. Can we do this one in class?